Standing Liberty Quarters have garnered a lot of attention from numismatists for its outstanding design of Lady Liberty on the obverse as well as the majestic bald eagle in flight on the reverse. The coin was minted from 1916-1930. The series was a short-lived one as the Washington Quarters took over these coins permanently. There is a high demand for these coins today both by collectors as well as investors. 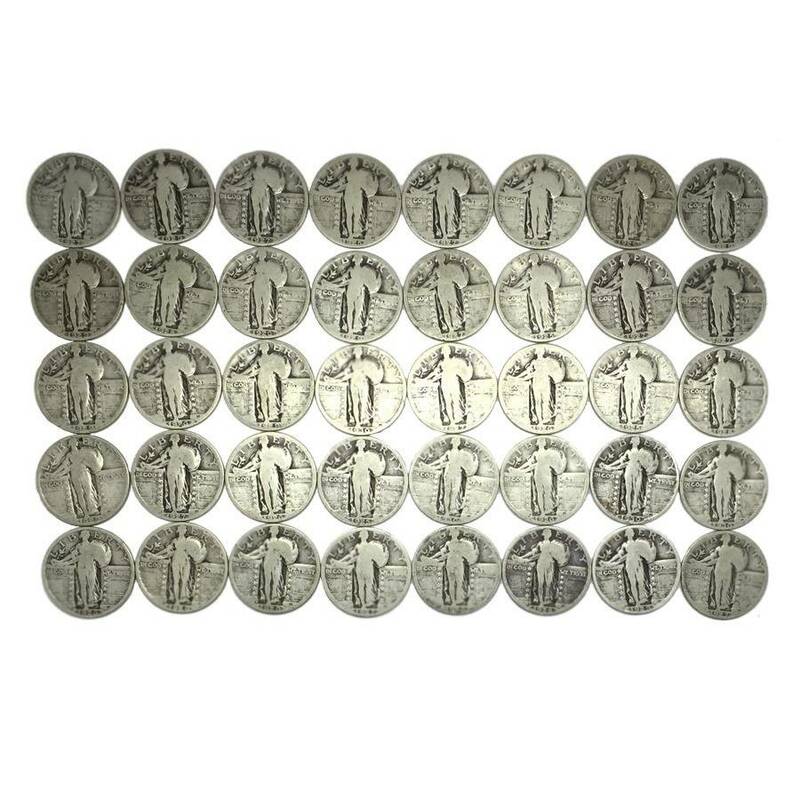 Now you can buy the Silver Standing Liberty Quarters with Dates in bulk of 40-coin roll with a face value of $10 in total. 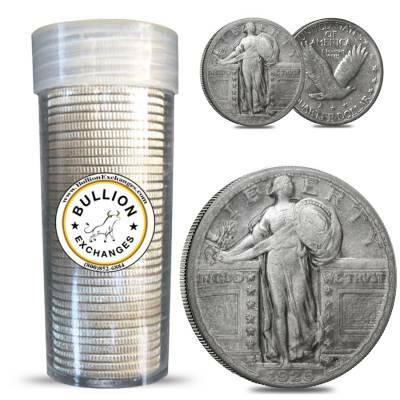 Each coin in the roll contains .1808 (approx) troy ounce of 90% pure silver. Total weight of 40 coins approximately 7.15 troy ounces. Each coin in the roll is in Circulated Condition with Dates. 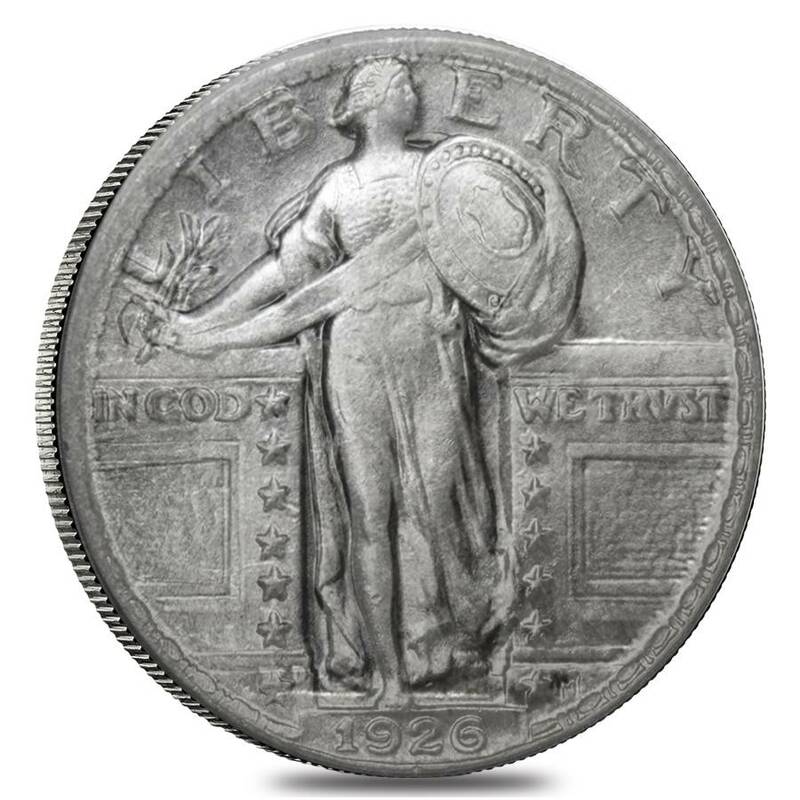 Obverse: Features Liberty in full length frontal view, her head turned towards right with her right hand holding a shield and left hand holding an olive branch as she strides through a gate between two walls. Inscriptions - “IN GOD WE TRUST,” “LIBERTY,” and Year of Mintage. Minted from 1916-1930. Dates will be chosen randomly based on availability within the mentioned period. Mint issues chosen randomly based on availability could be from Philadelphia (no mint mark), Denver (D), and/or San Francisco (S). 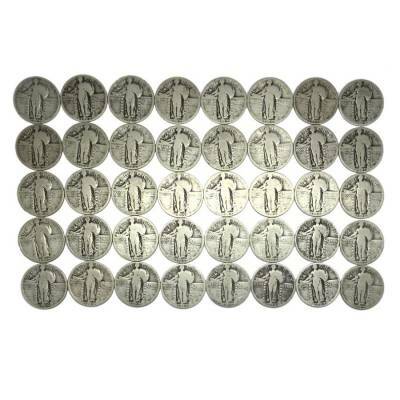 Comes in a clear protective plastic roll containing 40 Standing Liberty Quarters for a total of $10 face value. Why Buy Standing Liberty Quarters? Pre-1965 US Silver Coins come at competitive premiums. Standing Liberty Quarters have a lot of historical significance with great numismatic value. They were short lived series, hence completing a set is easier. The 90% silver content in them makes them an ideal investment option. They are legal tender issues of USA; can be used as currency in an emergency situation. The Standing Liberty Quarters depict the American bravado and desire for peace in much gusto. Since Europe was already on the warpath, America showed its preparedness for war but the desire for peace with its coins. The Standing Liberty Quarters were minted in 1916 till 1930. It was a misinterpretation of the 1890 Act by the Director of US Mint, Robert W. Woolley, that he was not just allowed but also required to replace old coins with new coins after the old coins have served for a period of 25 years. The Barber Dimes, Quarters, and Half Dollars had been in circulation since 1892 and by 1916, it had completed its 25 years, so Woolley decided to introduce new coins. The Barber coins had met with a lot of criticism for its designs upon its release and all three denominations contained almost same designs. So, Woolley’s intention was to give different designs to different denominations which were appealing to the eyes and were appreciated for their artistic value. Although Charles E. Barber was given a chance to design for the new coins, his designs were rejected by the Commission of Fine Arts. The Commission held a competition between three New York sculptors; Adolph Weinman, Hermon MacNeil, and Albin Polasek to design for the new coins. They had the option to submit multiple sketches. Woolley had hoped that each sculptor might get a coin to design. However, when the sketches were submitted, a discussion between Woolley and the Treasury Secretary McAdoo, led to selecting five designs of Weinman (two for dime, two for half dollar, and one for the reverse of quarter), one of MacNeil and none of Polasek. However, the members of the Commission advised Woolley not to entrust a single artist with so much work. 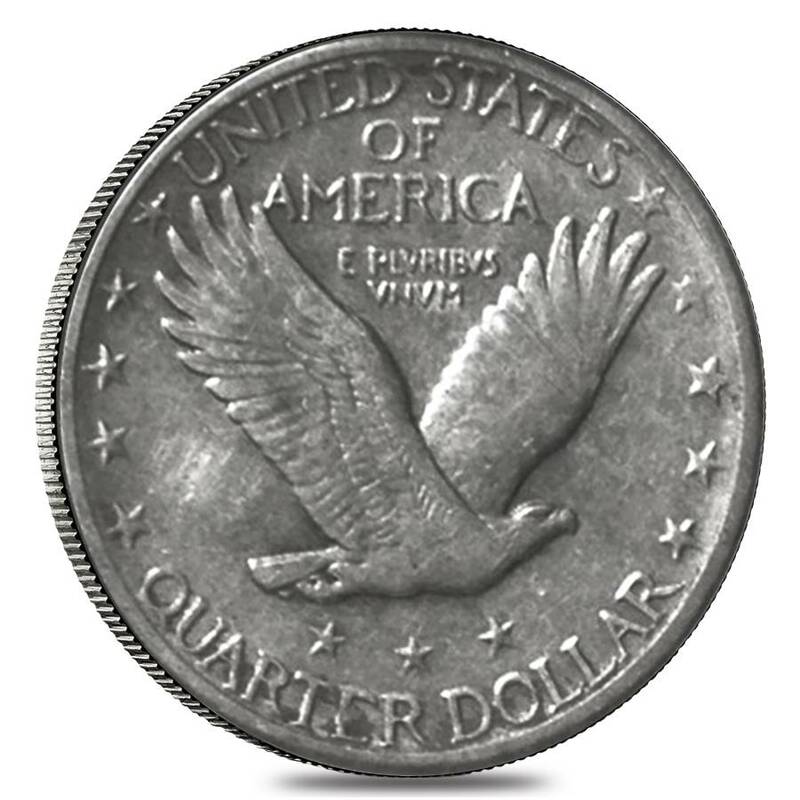 Once Woolley was convinced, MacNeil was given the responsibility of designing both the obverse and reverse of quarter while Weinman was given the opportunity to design for dime and half dollar. MacNeil succeeded in designing one of the most beautiful designs of a militaristic Liberty which sent out a strong message to the entire world of America’s desire for peace as well as military readiness. Bullion Exchanges is pleased to offer the $10 Face Value Standing Liberty Quarters 90% Silver 40-Coin Roll (Circulated w/Dates) at one of the most competitive prices in the industry. Browse our vast collection of Standing Liberty Silver Quarters and other silver coins, and feel free to contact us at 800-852-884 if you have any questions in regards to any of our products. With this purchase, you earn 152 Bullionaire Bucks 152 BB = $0.15. For every $1 spend, you will earn 1 Bullionaire Buck which is equivalent to $0.001 off a future purchase. 152 BB = $0.15.